A small city located in the east of Kodagu(Coorg) district of Karnataka, Kushalnagar is a laidback city blessed with the scenic beauty of nature. The name Kushalnagar means 'the City of Gladness', believed to be named by Hyder Ali. One can enjoy the major attractions of the city like The Namdroling Monastery, Kaveri Nisargadhama, Harangi Reservoir, Chiklihole Reservoir and Herur, Dubare Elephant Camp, to name a few. So, If you are seeking a quiet weekend away from the hustle and bustle of city life, then it's a very ideal tourist destination to visit. Namdroling Monastery: Visit Namdroling Monastery in Bylekuppe to see the inner shrine, which will simply leave you astounded. Tourists will completely be overwhelmed by the color and the music of the Tibetan Temple. It's a famous attraction for globetrotters as the monastery is the biggest teaching centre of Nyingmapa Tibetan Buddhism in the world. Dubare Elephant Camp: Come to see Dubare Elephant Camp, which rests across Cauvery river near Kushalnagar. 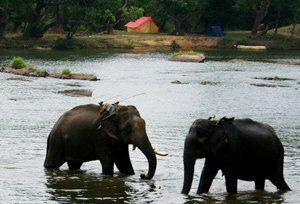 Here guests can get enthralled by witnessing Elephants and enjoy elephant ride and coracle ride as well. Cauvery Nisargadhama: Visit Kushalnagar to explore Cauvery Nisargadhama, a 64 acre nature park where plenty of animals reside. It's a place where you can enjoy picnicking with our dear ones. Feeding deers and Elephant rides are the major attractions here. Kushalnagar has a fair amount of places to stay. All the resorts and hotels offer excellent services, ensuring a pleasant experience to every guest. By Air: Mysore Airport (101.6 Km) and Managlore Airport (173.9 Km) are the nearest airdromes to reach Kushalnagar. By Rail: Mysore Junction (87.3 Km), Hassan Railway Station( 75 Km) and Sakleshpur Railway Station (80 Km) are the nearest railheads to reach Kushalnagar. By Road: There are many KSRTC and Private Buses that have access to Kushalnagar from several cities like Madikeri (30 Km) on the route of Mysore and Bangalore Highway.